Lineup - Maciej Obara: saxophone; Dominik Wania: piano; Ole Morten Vagan: bass; Gard Nilssen: drums. 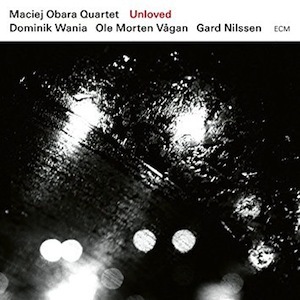 With eager expectation but also unflinching confidence, Polish alto saxophonist Maciej Obara leads his inspired quartet, established in 2012, with a solid sense of unity, hoping for a great debut on the ECM label. In fact, Unloved, the group’s first studio album doesn’t disappoint, thriving in a crescendo and maturing in our ears after repetitive listenings. The six original compositions plus one cover were brought forth with the talents of his country fellowman pianist Dominik Wania, who met the saxophonist during a fruitful stint with the Tomasz Stanko group, and the Norwegian Ole Morten Vagan and Gard Nilssen on double bass and drums, respectively. Obara and his peers set up varied musical settings that range from duskily contemplative to controllably busy to powerfully abrasive. Both “Ula”, the opening track, and “Joli Bord”, a crepuscular portrait of a desolate landscape, belong to the first kind mentioned above, the sort of composition that Eberhard Weber would write. The former piece comes enfolded in this wintry, almost elegiac coating that derives from minor harmonies and the concise chamber movements provoked by Vagan, whenever he employs the arco. Whether a lament or a prayer, it appends a strong, gray-hued lyricism. Conversely, the nearly pop atmosphere of “One For” lets the light in as an ear-catching bass groove adheres to the understated drumming and nice piano accompaniment. On top, Obara’s brushstrokes color the canvas with leveled timbres and surgical precision. Yet, it’s Wania who steals the show here, taking off on a tactful solo that brings up his advanced jazz language. Symbol of astounding interplay and communication, “Sleepwalker” exposes folk charisma in the theme’s statement and, at last, presents Obara as a dashing improviser, capable of stimulating listeners and the rhythm section itself, which responds with prompt counteractions and triggers further incitement to exploration. The only non-original selected for this album was the title track, a plainspoken ballad composed by Krzysztof Komeda and arranged with subtle arpeggiated harmonies as well as melodic parallelism and counterpoint. After a solo piano preliminary section shrouded in alluring intrigue (a stern, slashing bowed bass joins for the final minutes), the stirring “Echoes”, an uptempo yet static tune, makes the bandleader return to the spotlight. Always alert to Obara’s fervent attacks, Wania responds and also shines in his improvisation as he fearlessly incurs in labyrinthine alleys with extraordinary agility. The unobstructed sounds of Maciej Obara Quartet, a group with a strong talent to transform and adapt, oscillate extravagantly in mood, according to the emotional fragility or exhilarating imperiousness that might prevail. It is, indeed, a wonderful ECM debut.